On Thursday 19 April 2018 Her Excellency the Honourable Kerry Sanderson AC, Governor of Western Australia unveiled the first marker installed in the new Perth Commonwealth Walkway. When complete, the Walkway will encourage residents and visitors to enjoy a self-guided walking and learning experience which focuses attention on areas of history or places of interest in the city, including Aboriginal heritage and culture. 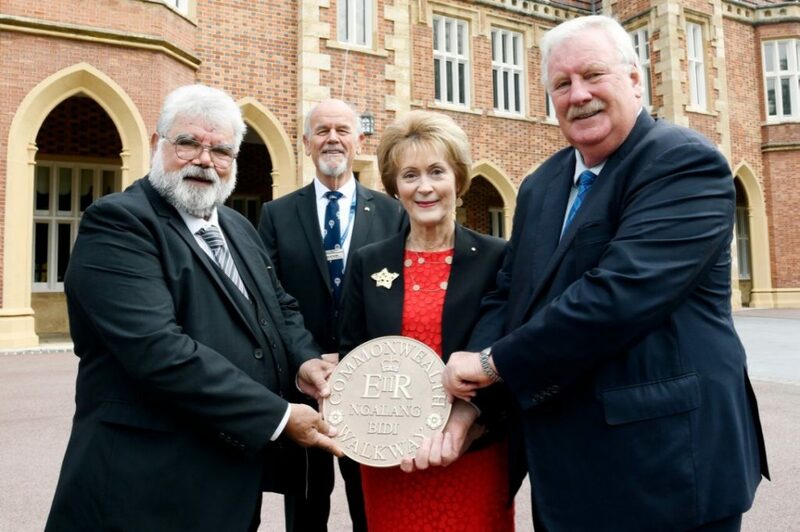 Each site in the route will be marked permanently with a large, in-ground bronze marker displaying the words Ngalang Bidi, which means ‘Our Path’ in the Whadjuk Noongar language, alongside the Queen’s personal EIIR Royal Cypher. The inclusion of the Whadjuk Noongar language is unique to the Perth Commonwealth Walkway and signifies the first time an indigenous language has aligned with the Royal Cypher in such a way. The launch of the new Perth Commonwealth Walkway aligns with an important time for Australia’s global connections, with the recent hosting of the 2018 Commonwealth Games on the Gold Coast. At the unveiling ceremony at Government House, distinguished Aboriginal Elder and 2018 NAIDOC Male Elder of the Year Dr Noel Nannup provided a traditional welcome to country. The marker unveiled by Her Excellency at today’s launch can be found on the footpath outside Government House at the Pier Street and St George’s Terrace intersection. A second marker was also unveiled at Parliament House. Additional markers will be unveiled at other significant places around the city in the coming months, along with more information about how to navigate the final route.